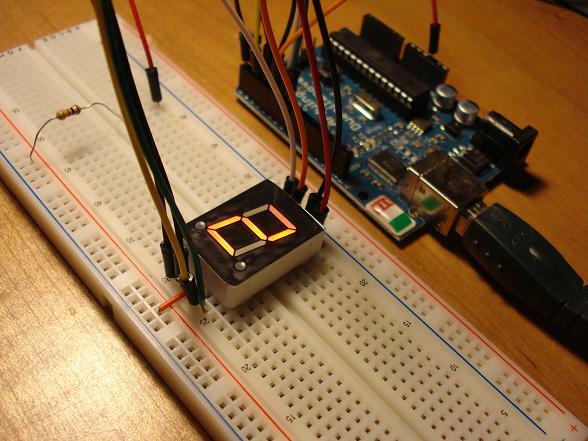 For this tutorial you will need a 7 segment indicator. I recommend that you get the one I got. What I have here is a 7 segment led, each of the segments will be controlled by a different pin in the board, we don’t have to use both of the power pins, please note that although I marked the top pin in my circuit with 5 volts I will use the bottom middle pin, you can use either; I have named each segment and connection as in the picture below. 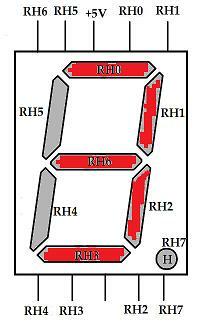 RH0 refers to digital pin 0, RH1 to digital pin 1 , RH2 to digital pin 2 and so on. Now the way my circuit will be wired, as you’ll see below in a moment, if I want to display a number I will have to set the pins used by that number to zero. 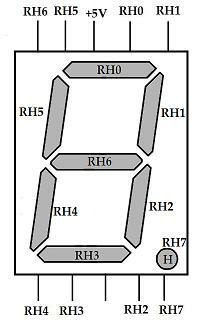 For example if I want to show the number three I will have to set the pins 0 1 2 3 and 6 to zero, all my other pins will be set to one. This might sound contrary to what you think ( 1=off and 0=on ?) and it is for this circuit. 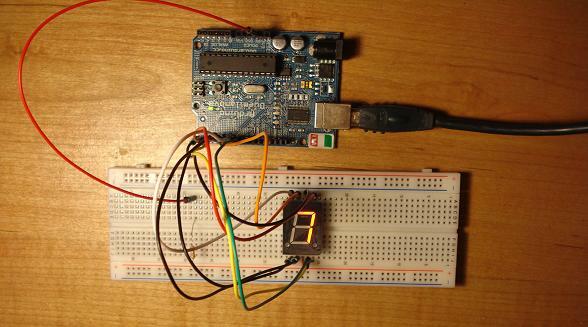 For this part just follow the picture of the 7 segment indicators and connect each pin from the indicator to the pin in the board. The pin in the middle at the bottom will be connected to a resistor (1k in my case) and the 5 volts pin in the board. Here’s a picture to give you a better idea of how the circuit should look like. I bet you are thinking about all the typing you are going to have to do in order to set each of the pins to their respective state (on or off) for each number. Here is what I think you are thinking of typing to say display the number one. At this point you are probably not as excited as you were when you began reading so I’ll tell you of a little shortcut to do the same thing we did above. Yes that’s right, all that code we did previously replaced by one line. The way this notation works is each number, which can only be zero or one, to the right of 0b represents a pin. If you start counting from zero from the left of the semicolon you will see that the 1 and 2 place are set to zero and everything else is set to 1, like it should be in order to display the number one. 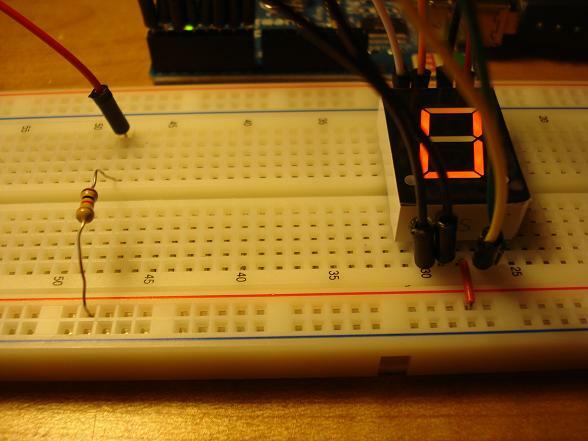 In my circuit I never want to display the decimal point and so my left most bit, which is pin 7, is always set to 1. If you know hexadecimal numbers, which I encourage you to learn if you don’t, you can replace the 0b with 0x and the number to the right with two numbers, for example to show the number 9 the code would be.